At about 10:00 a.m. today police and fire/medics responded to an injury accident with pin-in entrapment on Interstate 80 westbound just west of the 84th Street. Injury Accident: I-80 WB at 84th St.
Semi vs multiple vehicles with parties pinned. Police say the driver of a 2015 Peterbilt semi-truck with no trailer was traveling westbound on Interstate 80 just west of 84th Street and failed to notice a traffic slow down ahead. The semi collided with the rear-end of a white 2013 Toyota Prius that had four occupants. After the collision the front of the semi-truck collided with the rear-end of a blue 2008 Chrysler Sebring convertible. 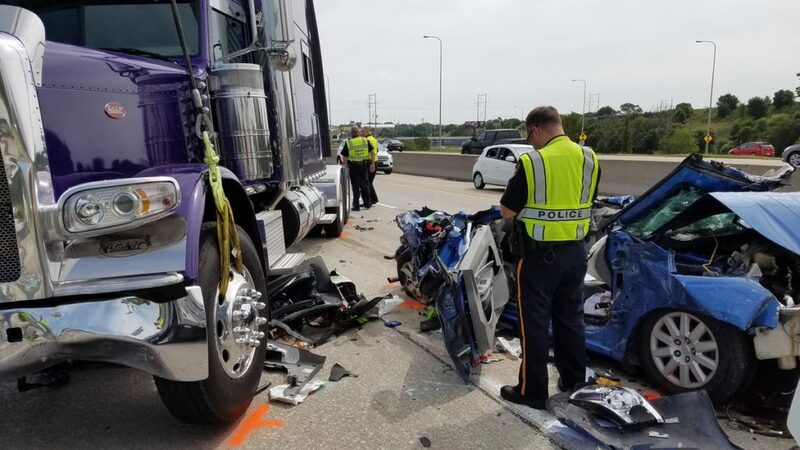 The semi came to a rest on top of the Sebring and forced the front-end of the Sebring into the rear-end of another semi-truck. Both occupants of the Sebring were trapped inside and underneath the semi-truck. 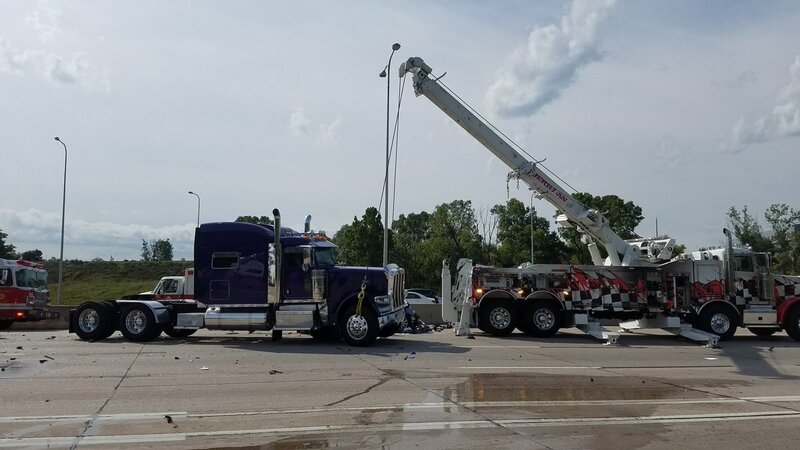 Arrow Towing Company was called to the scene and used a rotator heavy tow truck to hoist the semi truck off the Sebring and its entrapped victims. The patients were then extricated from the vehicle by OFD personnel and transported to the Nebraska Medicine trauma center. Medics rushed the left rear seat passenger of the Toyota Prius to Nebraska Medicine but she was pronounced dead at the hospital. The victim was identified as 19 year old Joan R. Ocampo-Yambing of Rosemount, Minnesota. Creighton University’s president Rev. Daniel Hendrickson SJ confirmed via Twitter that one student had died and others had been injured. A prayer service was held on campus at 7:00 p.m. at St. John’s Church. Driver of the Toyota Prius: 19 y/o Demetra N. Arvanitakis of Overland Park, KS, treated at Nebraska Medicine for skull fractures, back a back injury and severe concussion. Front passenger of the Toyota Prius: 19 y/o Madalene L. Steichen of Tulsa, OK, treated at Nebraska Medicine for a facial fracture and a head laceration. Right rear passenger of the Toyota Prius: 19 y/o William L. Tavis of St. Louis, MO, treated at CHI Bergan Mercy Medical Center for facial fractures and lacerations. Driver of the Chrysler Sebring: 54 y/o Kimberly J. Davlin of Omaha, treated at Nebraska Medicine for a left arm injury. Front seat passenger of the Chrysler Sebring: 76 y/o Joyce M. Cramer of Omaha, treated at Nebraska Medicine for internal injuries. The driver of the at-fault 2015 Peterbilt semi-truck was identified as 69 y/o Robert J. Richmond of Omaha, who reported no injuries. Also involved was the driver of a Freightliner semi-truck Lucius J. Hageman of Lincoln Nebrasaka who reported no injuries. Westbound Interstate 80 near the crash scene was heavily restricted until early in the afternoon.